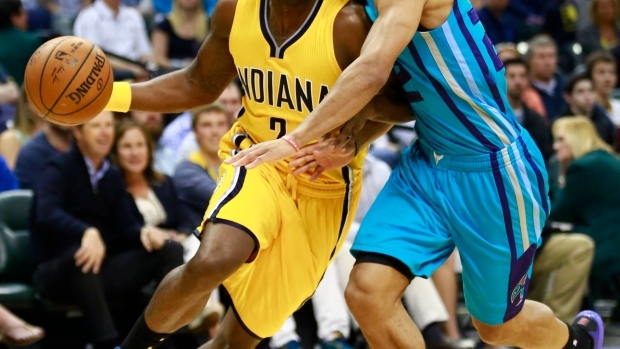 INDIANAPOLIS - The Indiana Pacers are desperate to make the playoffs. Against the Charlotte Hornets, they played desperate, too. Indiana has struggled since going on a season-best seven-game winning streak at the end of February and the first part of March — a stretch that gave the Pacers high hopes for a spot in the playoffs later this month. Against Charlotte, the Pacers looked like they had it figured out. After giving up 100 or more points in eight of the previous 10 games, Indiana gave up its fewest points of the season. Now the Pacers are a spot closer to landing in the post-season and hold the tiebreaker over the Hornets, who slip to No. 11 in the Eastern Conference. Former Indianapolis Colts wide receiver Reggie Wayne received a standing ovation when he was shown on the jumbo screen during a timeout. Fans chanted "Reg-gie, Reg-gie" as a "thank you" message was displayed on the screen. Wayne played 14 seasons for the Colts before the team announced they wouldn't resign him this off-season.